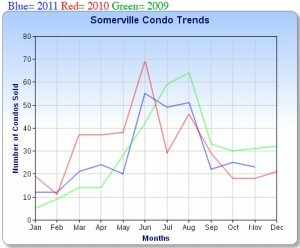 Somerville Summary: Condo inventory edged up by 3% over last Novemeber. ~ Listing $ volume is up by 2.3% from 46 million to 47 million. 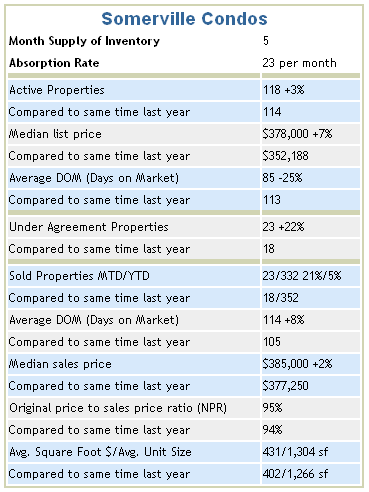 ~ The median list price shows an increase of 7% with the active days on market showing more demand by improving to 85 days from 113 in 2010 ~ Condos going under agreement increased by 22% and the $ volume is up 11.8%. ~ Condos sold for the month were up 21% with YTD moving up by 5%. 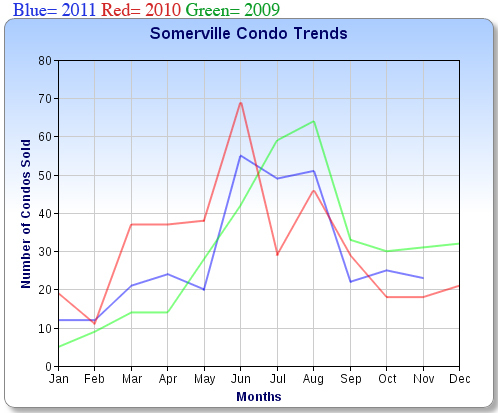 Somerville condo sold $ volume for the month increased by 27%, whereas YTD dropped 1.2% from 132 million in 2010 to 131 million this past November. ~ Sold average days on market increased by 8% . The original price to sale price ratio tightened a point to 95%. ~ The average square foot price rose to $431 per square foot for November with the average condo size also increasing 38 square feet to of 1,304 square feet.